Supportive counseling consists of ways that you can best encourage, empathize, and engage your patients during their quit attempts. Communicate belief in the patient’s ability to quit. Share that with proven nicotine addiction treatment and counseling, quitting success rates increase. Share that Medicaid, Medicare, and many private insurance companies cover smoking cessation treatment. Share that half of all people who have ever smoked have now quit! Ask how the patient feels about quitting. Directly express concern and willingness to help. Be open to your patient’s expression of fears of quitting, past difficulties with quitting, and ambivalent feelings. 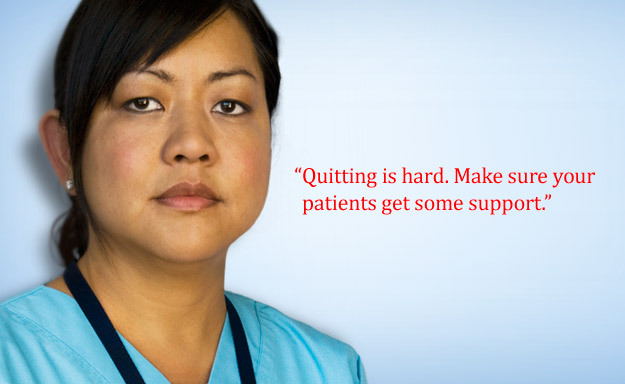 Encourage your patient to talk about the quitting process and reasons for wanting to quit. Ask your patients to share concerns they may have and past quit experiences, both successes and difficulties. Effective smoking cessation counseling, particularly when combined with medication, improves quitting success rates. Quitting is hard, and patients are more likely to make a quit attempt when they have their provider’s support. Providers should use the 5 R’s: Relevance, Risks, Rewards, Roadblocks, and Repetition as a guide. Encourage the patient to indicate why quitting is personally relevant, being as specific as possible. Motivational information has the greatest impact if it is relevant to a patient’s personal disease status or risk, family or social situation, health concerns, age, gender, and other important patient characteristics (e.g., prior quitting experience, personal barriers to cessation). Ask the patient to identify potential negative consequences of tobacco use. Providers may suggest and highlight those that seem most relevant to the patient. Acute risks: Shortness of breath, exacerbation of asthma, harm to pregnancy, impotence, infertility. Long-term risks: Heart attacks and strokes, lung and other cancers (larynx, oral cavity, pharynx, esophagus, pancreas, bladder, cervix), chronic obstructive pulmonary diseases (chronic bronchitis and emphysema), long-term disability, and need for extended care. Environmental risks: Increased risk of lung cancer and heart disease in spouses; higher rates of smoking by children of tobacco users; increased risk for low birth weight, SIDS, asthma, middle ear disease, and respiratory infections in children of smokers. Ask the patient to identify potential benefits of quitting smoking. Providers may suggest and highlight those that seem most relevant to the patient. Improved health status occurs almost immediately upon quitting and continues to improve over time. Feel better about yourself, physically and mentally. Home, car, clothing, breath will smell better. Improve the health of your babies and children. Ask the patient to identify barriers to quitting and note elements of treatment that can address these barriers. Withdrawal symptoms – the number one reason for relapse is withdrawal symptoms which include irritability, difficulty concentrating, restlessness, and craving nicotine. Repeat counseling every time a patient visits.Tobacco users who have failed in previous quit attempts that most people make repeated quit attempts before they are successful.